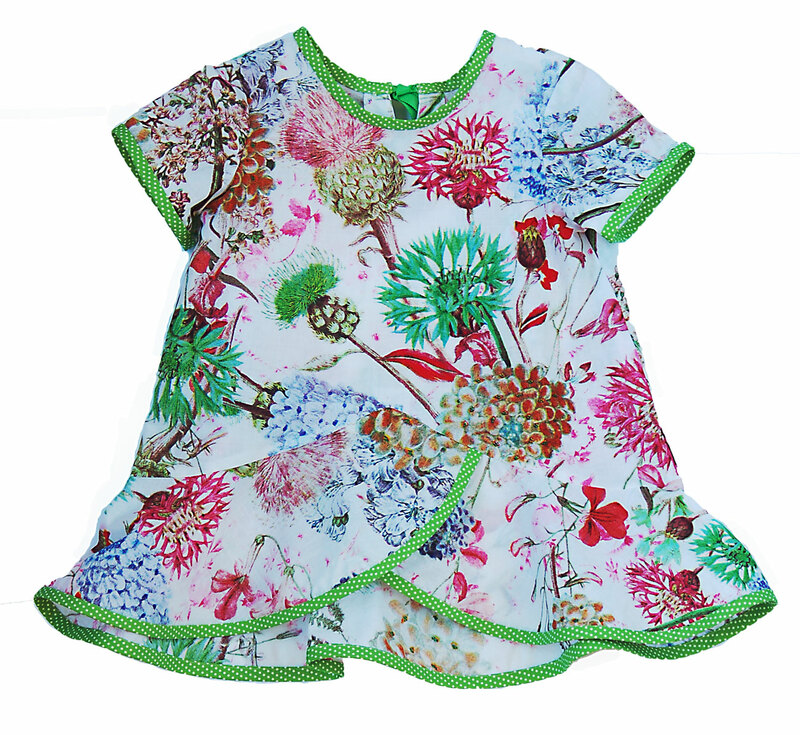 Today I’m introducing our second new pattern for Spring-Summer 2013. The Pinwheel Tunic + Slip Dress will be available on our website by March 5 and at retailers around the globe shortly thereafter. Here’s an funny little story for you. Back when I was mining my sketchbook and designing the prints for our Cape Ann fabric collection, I found a drawing that I had always liked but had never produced as a sewing pattern. I included the sketch in the print, and we received all sorts of queries about that design. Would we produce it as a sewing pattern? Well, twist my arm! That sketch eventually made its way toward the top of my list. But one of the things I love about our process is that things don’t always end up as they started. Yes, we produced the sketch. But I think we’ve improved it and added some fun options that I didn’t anticipate when we started. This design began life as a tunic, but the first muslin was too long and I didn’t like the proportions. When we remade it shorter, Giulia threw it onto the mannequin over the original muslin, and we loved the result of the two pieces together! It was so cute with two layers of flounces overlapping each other that we decided to make both a dress and a tunic, designed to be worn separately or together. And I love the the combination of the two pieces. The tunic, which can be worn by itself with leggings or jeans, has short sleeves and a cute little keyhole opening at the back, with ribbons to tie it closed. 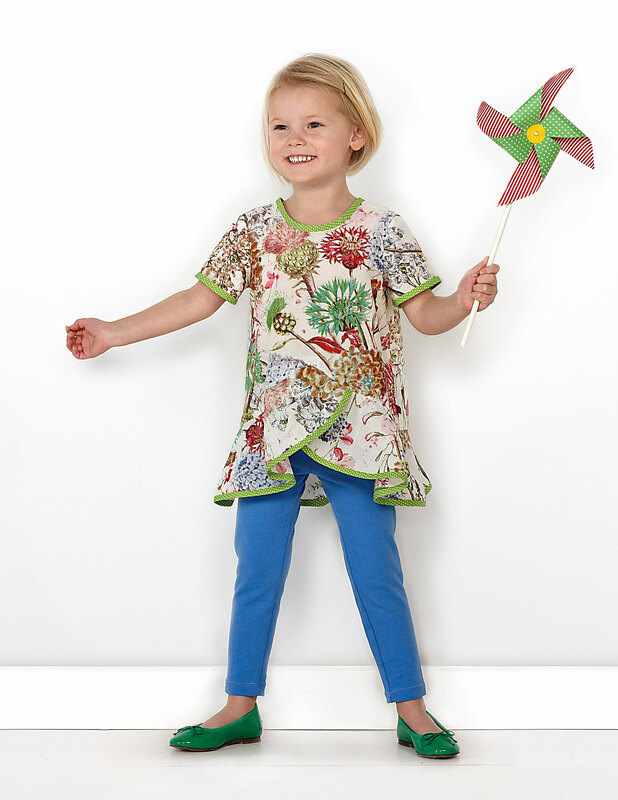 The flounce crosses at center front, and that gives the tunic that high-low hem that’s been really popular lately. For a little extra fun and a nice finish, we’ve used bias binding to finish the neck, sleeves, and hem. I think it highlights the lines really nicely and give you a fun way to bring another color or fabric into the tunic. 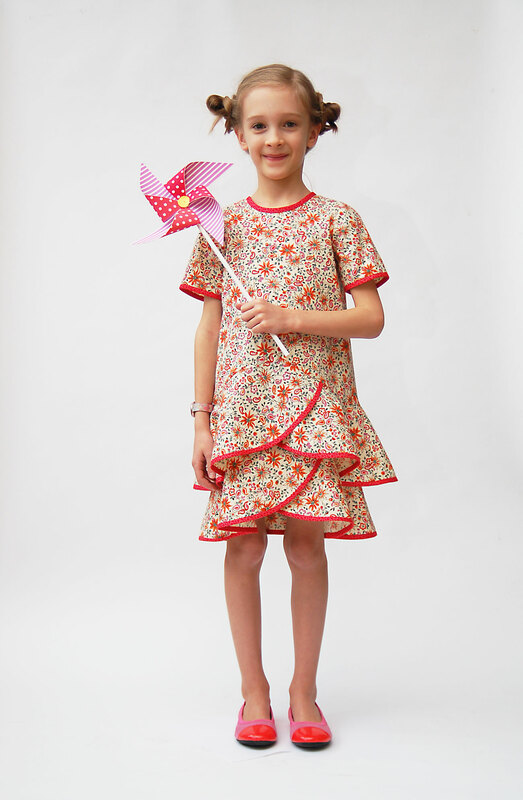 This piece feels a just a tiny bit like a peplum, but it’s a child-friendly non-fussy peplum. Just cute, that’s all. The sleeveless dress has the same fun flounce as the tunic. The dress can be worn by itself or layered over a T-shirt or blouse. I think it would be a darling summer nightgown, too. This is a simple pattern that’s easy and quick to sew, and I think you’ll like the way the bodice and straps are constructed. Simple and interesting at the same time. And this is a pull-on style, so there are no closures! Both pieces are great on their own, but I think the real magic happens when you combine them! It’s flouncy without being saccharine. Which is about as frilly as I can do. (You know I’m not really a frilly designer, right?) And I think it’s cute on kids of all ages. I’d totally wear the tunic, myself. And apparently I’m not alone. I nearly fell over when I saw this Narciso Rodriquez tunic during Fashion Week. I love it! 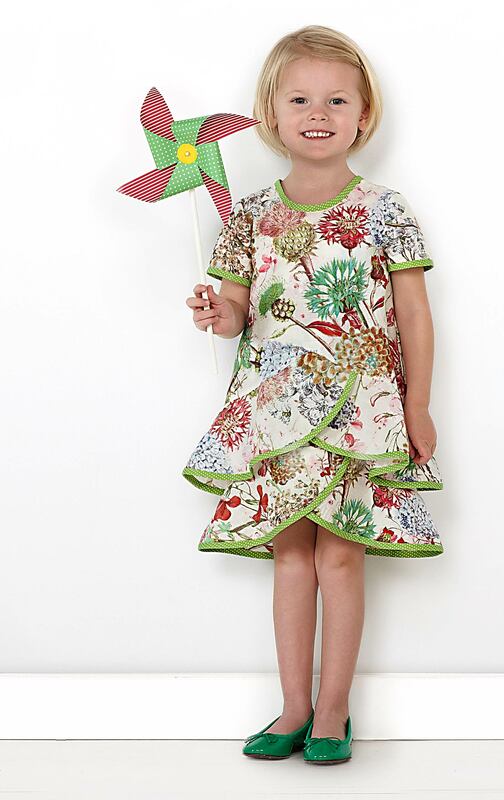 I love your comment “You know I’m not really a frilly designer, right?” as it really sums what I expect from Oliver + S patterns (and your gorgeous designs): just the right amount of cuteness and contemporary design for children. I do love a bit of frills and bows, but again, I just need to make sure I get the right balance. Otherwise, I don’t think my girl could wear the clothes I made her on a daily basis and on so many and different occasions. I always love to read about the creative process behind a new pattern. It’s so inspiring! These are really sweet, but that thistle print is awesome! This is FANTASTIC! waiting with bated breath by the computer for March 1! Counting down the days until March 5th. I love it!! I agree, I need the details on the fabrics. Thank you Liesl; this little dress/tunic looks just wonderful -stylish but simple, and so lends itself to “showy fabric”. Both garments will get a huge amount of use in Australian spring/summer. Love the short sleeves in particular. When you first teased your devoted fans with the first pictures of pinwheel, I was terrified that was zipped, or had to be made of stretch fabric, and I guess it could be, but I’m relieved to know that I should be able to manage making it. Just great!! Liesl! THIS IS PERFECTION! It is rare that I see a pattern and opt to buy it at a glance. THIS ONE is a must have. Can we preorder? I’m not sure I can wait until March 5! maggieb! I already want to start buying fabric!!! Can you share approximate fabric/trim needs for the bigger sizes? Sweet as pie! So I am not a frill girl either, and I was kind of meh about this pattern, even though I like a bit of peplum here and there. I figured, ooh a pattern I can skip. Yeah, right! Then I saw the dress without the tunic and went… Sigh…. just love the simplicity of the tunic. Agreed, it’s really interesting and delightfully on trend in a child appropriate way. I really did not see this coming with the sketch you teased us with earlier. Two pieces! I like the tunic alone too. You say it’s not frilly, yet I think it is a good way to change things up for girls who like ruffles. I look forward to the release and I simply can’t wait to see the third one! I love this pattern too. I really like the fact you can layer them. We live in Florida. It is very warm outside and freezing in buildings with the air conditioning. This outfit can resolve comfortable issues we have with summer dresses. Love these new dresses so much! The new patterns are just so beautiful. Can you clarify if both patterns will be released together or on separate dates either March 1 or March 5. I would like to order together so there will be only one shipping charge. Karen, they will be released together. We had been planning on a March 1 release, but the blizzard in the Midwest this week has put that date at risk. We’re still hoping for March 1, but have said it will be BY March 5. If you subscribe to the newsletter, you’ll get an email as soon as they are ready to ship. How do I purchase your patterns, I keep clicking on to these pattern sites, but can’t get any further than that. please help. I can sew but not the best with computer technology. Georgina, these patterns won’t be released for another week or so. When they are, there will be links that will take you to a page that will allow you to purchase. Both of the new patterns you’ve previewed so far are just so beautiful. I can’t wait to see the others! Honestly, I just can’t stop thinking about the dress you made here for S. I love it, love it, love it. I made myself a promise that I wouldn’t buy a new pattern until I had sewn at least one garment from all of the patterns I’ve already bought (which are patiently waiting for me to have some time! ), but come next week when the patterns are available, I know I’m going to be breaking my own promise! Oh, that’s cute! I love the fabric. Looks like there’s no shaping to the side on this dress; it’s straight from the shoulder to the hem, more like the Caftan project I did for CreativeBug. The Roller Skate Dress has more of a sleeve, with shaping at the armhole. But you’re right; the silhouette is similar! Please forgive me if this is the most bonehead question ever. If you want to make thedouble layer dress do you make the slipdress and tunic and just slip the tunic over the dress? Or can you make it as one piece? Really, sorry for asking, I just couldn’t tell from the pictures. Erin, yes, that’s correct. You layer the tunic over the slip dress. LOVE it!! I’m so excited!!! I, too, like these dresses a lot. Are you going to release another pattern this spring? You have always released 3 at a time, haven’t you? Also, are you designing voile fabric? The Pinwheel pattern looks as if it was constructed out of voile. 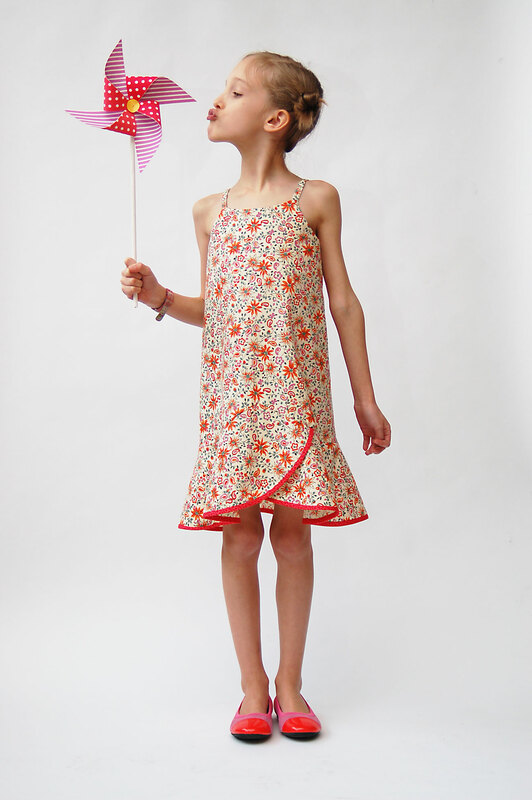 I think the roller skate dress would drape nicely if made from voile and lined in batiste. Hello, I am excited to make this for my daughter and I’ve even bought fabric in preparation. I’ve been waiting for the 5th, but don’t see it anywhere. Where can I buy the pattern? Dan, the patterns will be available on the website later today. i commented before but I guess it got eaten? anyhow, I saw this and wanted it from the first, but I’m so glad that it’s a tunic with a bow in the back and slip-dress instead of a zipped full dress… IMHO it’s all good so dd can dress herself, and the two layers will give it some extra warmth for the unpredictably cool Easter we might have. I hate to cover up the cute with a jacket! I’ll still make zip-back dressy dresses (inordinately proud of the fairytale one at Christmas) for special times but these two pieces will be in heavy day-to-day rotation for sure. Reeni, yes sorry about that. Our blog spam filter has been acting up for the last few days and we seem to have lost a few comments. Oops! My comments should have said 3/4 inch binding (and 1 1/2 inch fabric strips). But I still am confused about what size bias tape maker to use. Ashley, my apologies! I missed your question earlier. A 3/4″ bias tape maker will give you 3/8″ wide binding when it’s sewn and finished. Does that help? What fabric did you use for the samples, Liesl? They are both beautiful!! The fabric on the first sample is from Mood, here in NYC. When I was there a couple of weeks ago they still had some, so if you get in touch with them you might still be able to purchase it. The second sample, on S, is from the DS Quilts collection, designed by Denyse Schmidt and available at JoAnn Fabrics. I hope that helps! Just making the dress part of the pinwheel pattern and having an issue. The front of the dress at the side seam is about an inch longer than the back. What am I doing wrong? I doubled checked the scale when printing and it was fine.